Legendary Sour Cream Coffee Cake for sale. Buy online at Zingerman's Mail Order. Gourmet Gifts. Food Gifts. 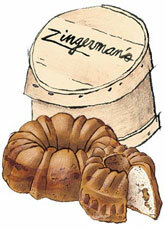 This is a Zingerman’s classic and perennially our most popular gift: rich, moist Sour Cream Coffee Cake made with organic flour, loaded with Indonesian cinnamon and toasted walnuts, baked in a traditional bundt pan. It’s very impressive and extremely delicious. And it lasts. In theory, a week or two after delivery, wrapped, it’ll still be soft and scrumptious, melting in the mouths of a hungry office staff. Personally, I've never seen one withstand the onslaught of the hungry for more than an hour. "I sent a sour cream coffee cake to a friend, and they served it for Christmas brunch. I got a call yesterday, and with all their guests in the background, they just raved about it. It was the hit of the brunch!"